WordPress allows users to create two type of content – post and page. As a new user you may be confused what are the differences between these content types and in which scenarios they are to be used. In this article let us explore more on the key differences between WordPress posts vs pages. A website has some content dependent on time and some independent of time. For example, the content of “About Us” or “Contact Us” pages of a site in general is not dependent on time. They are more static in nature without much change required over the period of time. A blog post in contrary is relevant to that particular point of time. For example, article on new product launch should be on blog post with the timestamp on it. In order to indicate the time relevancy of an article, WordPress displays the timestamp on a published blog posts while pages don’t have timestamp on it. Based on the theme, the timestamp may be displayed as only date or date with exact publishing time. Posts created are part of blog index and archives and can be grouped with categories and tags. Pages are independent and different pages can be linked in a hierarchical parent-child relationship. When you are in WordPress admin dashboard, navigate to “Posts > Create New” to create new post for your blog. All published, draft and deleted posts can be seen under “Posts > All Posts“. Similarly, pages can be created under “Pages > Create New” and can be managed under “Pages > All Pages”. 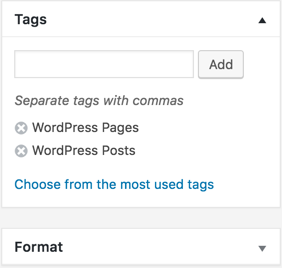 WordPress visual editor has different set of meta boxes for post and page. 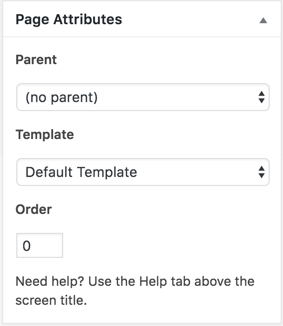 the meta box “Page Attributes” can only be seen for pages to choose the order, template and hierarchy. Post will have meta boxes for adding categories, tags, excerpt and trackbacks along with option to choose the format. Though pages have author meta box, author name is not displayed on the published page. Also by default comments are disabled on pages which can be enabled for individual page in page editor. Posts have published date, category, tags and author name displayed while pages have none of these elements. Below are the summary of key differences between WordPress posts and pages. Grouping Related posts are grouped under category. Posts cannot be linked in hierarchical manner. Pages are linked using parent – child relationship in hierarchical structure. 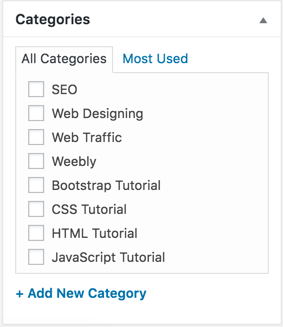 Page does not use category. Template Generally same template is used for all blog posts. By default the post template is named as “single.php”. Different pages can have different templates. By default WordPress uses “pages.php” for page template. Tagging Tags are used to create index and link posts having the same keywords. Page does not use tags. 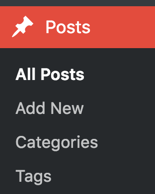 Meta boxes Posts have “Categories”, “Tags” and “Excerpt”. Pages have special meta box called “Page Attributes”. Blog index Posts are displayed on blog index page in reverse chronological order. Pages are not part of the blog index page. Comments Allowed and enabled by default. Allowed but disabled by default. Feed Part of RSS and other feeds. Not part of any feeds. Time bound Generally time bound and valid for particular time. Hence WordPress displayed date of publishing on the published posts. Content not changing with time and static in nature. Hence WordPress does not display date on the published pages. Author Author name is displayed on blog posts. Author name is not displayed in published pages. Social Sharing Posts are shared and sharing meta box of the plugin in shown in post editor. Pages are not shared on social networking sites. Sharing plugins may not display meta box in the editor. A WordPress site can have a blog index page as a front page or have a separate static page as a front page. You can change this under “Settings > Readability” and for a static page you should have at least one page created on your site. When you choose a “Your latest posts” for front page displays, you should create a page named “Blog” to host the latest posts as an index page.